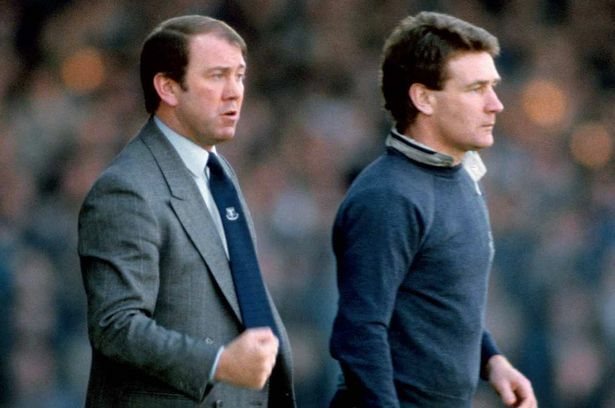 The great Everton team of the 1980’s was sensational, built by legendary manager Howard Kendall, they went on to the most successful side in the history of the club. In his recently published autobiography, Kendall described how he built his all-conquering team, transforming left wingers to right backs and extended the careers of hugely influential players who had been discarded by many as too old and too injury prone. The following extracts have been published with the permission of James Corbett of deCoubertin books.Howard Kendall’s autobiography, Love Affairs & Marriage, My life in football is available from deCourbetin books priced at £20. What started out as a team of unknowns would end up a team full of internationals. Andy Gray was the only full international that I signed; the rest of them – Southall, Ratclifffe, Reid, Steven, Stevens, Bracewell, Van den Hauwe, Sharp and Sheedy – would represent their countries by virtue of their excellence in Everton shirts. …at £150,000 he proved one of the best bargains ever. Neville became the world’s best, for me and many others, but it never changed him. Gary (Stevens)…was a left winger when I joined the club. I was a great believer in pace at the back and I thought he was worth a go in the full back berth…what an athlete he was too. I brought him (Pat Van den Hauwe) up from Birmingham, took him to a place called Tree Tops in Formby, had a meal with him, and said, You have a medical in the morning and everything is done. I’m paying a lot of money for you so be ready in the morning. Unfortunately Pat didn’t heed my advice. He went out drinking and was absolutely rotten going for his medical, I was furious. Kevin Ratcliffe was someone I had admired since my Ewood Park days…I tried to sign him in an exchange deal…(but) Everton came back and said no, but my loss at Blackburn manager was to be my own long-term gain. Kevin was a fabulous captain and centre back. It was really just local people talking about him that brought Derek (Mountfield) to my attention. We got permission to play him in a reserve game at Preston and for the money Tranmere were asking – just £30,000 – we saw enough in him to take a chance. I signed Reidy just before Christmas 1982, but it was a struggle. The club’s financial predicament was such that we had to change banks from the Midland to the TSB so that they would extend our overdraft to cover the deal. We weren’t talking vast sums either: just £60,000 secured a player who would be vital to the club. One of the players I knew straight away that I would do anything to sign was Trevor Steven. I went to Burnley a number of times to watch him play and he always shone for me. He looked an Everton player, and when I say an Everton player I’m talking about an Alex Young-type-player- than standard, that level of class. I had signed (Adrian Heath) after I missed out on Bryan Robson. I’d played with Adrian at Stoke and he was a record signing for Everton. I looked constantly for what the paying public would consider an ‘Everton type player’. By that I meant men who liked to go forward, have a crack at goal and entertain the fans. The acquisition of Andy (Gray) was a little bit fortunate, but his effect on the club was seismic…We didn’t have £600,000 to sign Mariner, so the board suggested I went for Andy. I progressed with the transfer, but when it came to the medical his knees were an issue. We got a specialist in who looked at the number of games he had played over the previous two years and said that if he developed his quad muscles…to stabalise the knee joints then there was no reason to fail his medical. I signed (Paul Bracewell) from Roker Park for £250,000 and, as with Trevor Steven, it was a great bargain. For 18 months or so he was absolutely magnificent with Reidy. They were on the same wavelength. If Reidy went in and closed down, Bracewell followed. If Bracewell did the closing down, Reidy was following him. I think it was a superb partnership. …Kevin Sheedy was a player that Colin Harvey had spotted. I went to Preston to see him play for Liverpool reserves with Colin and you could see his potential. His left foot was like a wand; his technique glorious. But I still didn’t think he had what it took. Previous Post MISSING? Will these guys ever play for Everton again? Next Post Martinez has more than just a plan B. Plan C, D and E is ready when necessary!!! The comments on Graeme Sharp seem to relate to Barkley against Villa. Maybe Hodgson being there made him feel he had to do something spectacular.